The system provides a user name/password dialog that allows end users to authenticate themselves. It also provides a security log UI which lets staff monitor potential security threats (such as password guessing programs) by viewing failed login attempts. User enters "zorf" for User name and "xyzzy" for password. 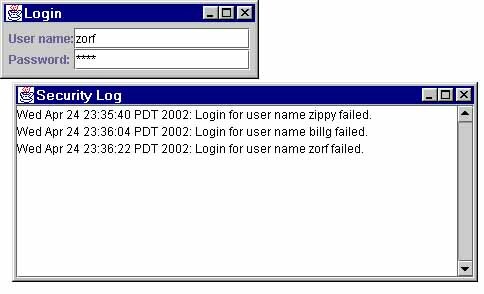 System displays "zorf" in User name field and ***** in the Password field. User hits Enter while in the Password field. System checks for authorization; in this scenario, the authorization check fails. System displays an error message dialog indicating that the login failed. System logs the failed login attempt. User clicks OK to dismiss the error dialog. SecuritySystem - Manages other objects, performs authorization check. PasswordPopup - End user UI window, collects username and password and checks for authorization with SecuritySystem. LogMonitor - Internal security UI window, displays interesting security-related events.